A great passion for nature, history, culture and food defines this little island. With some of the most magnificent untouched wilderness in the world, a rich convict legacy, world-class galleries and artisan produce, Tasmania is a treat for the senses, no matter what your appetite. From the salty dockside Salamanca Point to the extraordinary art housed in MONA and the delights of the Cascade Brewery, you’ll fall in love with Hobart before heading south to the World Heritage-listed convict enclave of Port Arthur. History and art combine with a visit to the incredible ‘Wall in the Wilderness’, before you go deep into the wilderness with visits to the Franklin-Gordon River and Cradle Mountain-Lake Saint Clair National Parks. Explore many of the quaint little towns scattered across the island, sampling the finest in Tassie hospitality before heading back to the wilds of Freycinet National Park. The extraordinary Wineglass Bay will capture your imagination before you make your way back to lovely Hobart. Journey to the coast via Legerwood and discover unique tree carvings, a memorial to World War I. Learn about the award winning cheeses from Pyengana Dairy Company, reputed to produce Australia’s finest cheddar, and delight your tastebuds with a tasting. Your final destination today is the breathtaking Freycinet National Park, where you’ll discover this incredible wilderness whilst enjoying a two night Special Stay. at Freycinet Lodge. (Additional expense). Enjoy a day at leisure to explore this coastal wilderness at your own pace. Marvel at the myriad of colours – pink granite mountains, white sandy beaches and sparkling turquoise waters. Take one of the many walks and soak up the beauty of Wineglass Bay. Visit the Tasmanian Wool Centre in the convict town of Ross. Your local guide will share stories of the town’s history and the influence of its first export – wool. Stop in Richmond and see Australia’s oldest bridge, built by convict labour. During a visit to Bonorong National Park meet Tasmania’s shy and elusive Tasmanian Devil, before arriving back in Hobart for two nights. 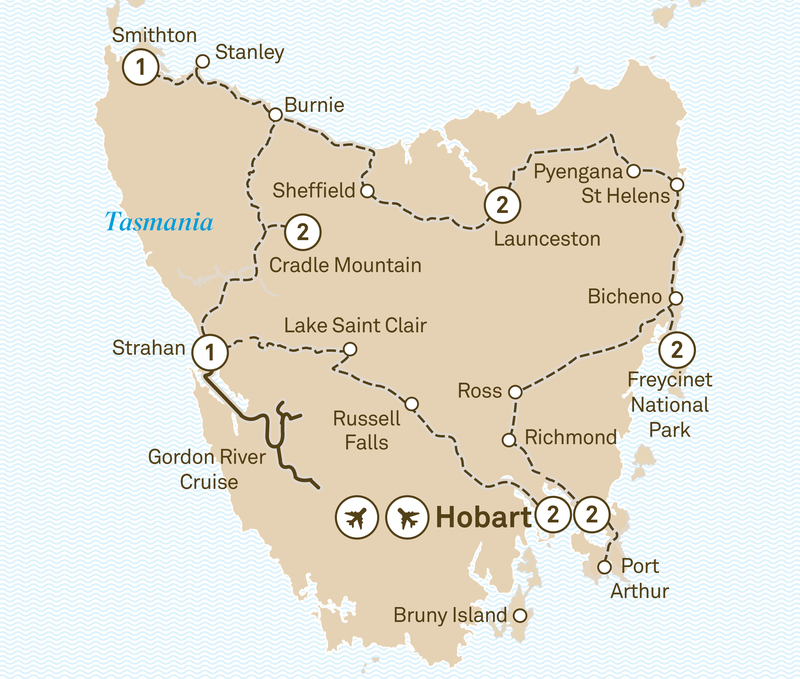 Choose from a range of Hobart attractions. Enjoy a cruise to Peppermint Bay or take a tour of the Cascade Brewery, Australia’s oldest. Alternatively, tour the Huon Valley and walk amongst the fruit orchards or cruise on the MONA ferry and enjoy a tour of the daring Museum of Old and New Art. Toast your adventures during tonight’s farewell dinner at the Drunken Admiral restaurant. It’s time to say farewell to new friends and the wonders of Tasmania.